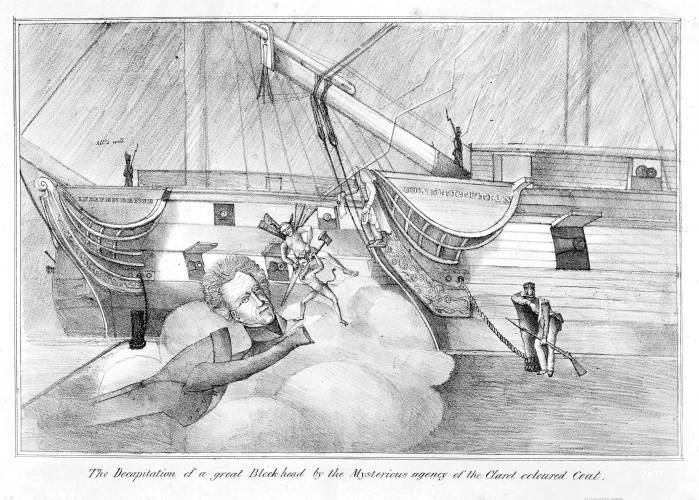 A cryptic and anonymous satire probably referring to the 1834 "decapitation" of the wooden figure-head of Andrew Jackson, placed on the ship "Constitution" when it was refitted at Boston. The deed was perpetrated after Boston Whigs protested the newly-placed improvement. In a thunderstorm two ships, the "Independence" and "Constitution" are moored at a dock. A sentry on the deck of the former says "All's well." In the foreground another sentry sleeps leaning on a post. Two small demons have just removed the head of Jackson from the figure-head, and it is borne off by an empty coat. Malcolm Johnson (no. 142) records another satire on this incident, produced by David Claypool Johnston for Anthony Imbert.